This is every chocoholic's dream tour. 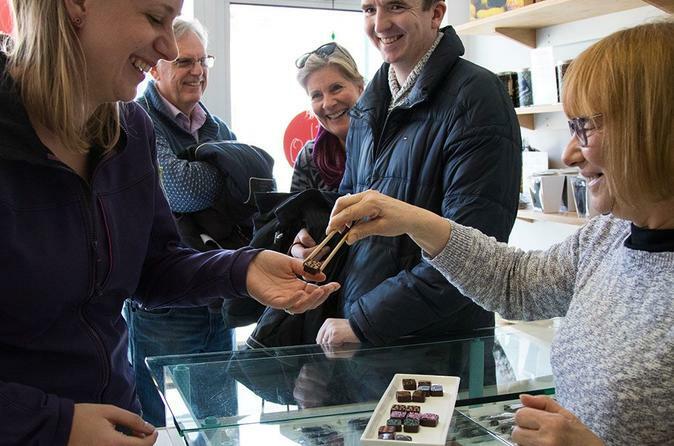 You can't call yourself a real chocolate lover if you haven't been on the only chocolate tour in Toronto that divulges the art of chocolate tasting and samples chocolate from bean to bar! Come join your local guide, for 3-hours as you walk the trendy streets of King West, Queen West & Dundas West, enjoying chocolates & chocolatey sweets while chatting with chocolatiers and store owners. Along the way, you'll discover where chocolate comes from, how some chocolate can be good for you, and why you crave it - while satisfying those cravings! This small-group tour is limited to 10 people to ensure an intimate atmosphere and high-quality experience. At the end of the tour, leave with a Toffle™ aka a Toronto Truffle, a new dessert invented by Tasty Tours. Inspired by the flavours of Toronto and Canada, the Toffle is a decadent cross between a maple butter tart and a chocolate truffle. You can only get this on a Tasty Tour! Crafted by serious chocolate lovers, it is guaranteed that you'll have a chocolatey good time on Toronto's Ultimate Chocolate Tour! Start off at a prestigious bean to bar chocolate maker, where your guide and fellow chocoholics will guide you in the art of chocolate tasting as we sample locally made chocolate. You'll then stroll through the hip streets of King St, Queen St and Dundas St West, popping in and out of some of the best local businesses in the city. Along the way, you'll try a variety of chocolates and other chocolate-based confections, all the while learning tidbits of chocolate history. You also will get the opportunity for you chat with a number of store-owners, staff and chocolatiers, including the winner of a Food Network cooking show. After all the eating and educating, the fun isn't over! At your last stop, you'll get a behind the scenes opportunity to watch an award-winning local chocolatier demonstrate how she creates her delicious chocolate truffles. You'll leave the tour with a happy belly, a greater appreciation of chocolate and the passionate local businesses in Toronto, an afternoon of sweet memories...and perhaps the best thing of all, a Toffle™.The Toffle aka Toronto Truffle is a popular new dessert invented by Tasty Tours. Inspired by the flavours of Toronto and Canada, the Toffle is a decadent cross between a maple butter tart and a chocolate truffle. You can only get this on a Tasty Tour!